It is clear from contemporary reports that the demolished church was regarded as a quarry from which anyone might take stones for building. Because stone buildings were uncommon in the vicinity it was easy to see where the stones were being used. Reports claim that stone from the church were to be seen scattered about the village of Ruddington. They were used to mend roads, to make pig sties and to repair horse blocks. Stones were taken to wall the new churchyard in the village when it was consecrated in 1773. One writer reports that the materials of the chancel with its marble monuments were sold to repair lanes and highways. The overseer of roads in the Plumtree district was blamed for taking stones from the site and using them for road repairs. Unfortunately, the stone robbers were not content with the remains of the church, but took to uprooting gravestones from the churchyard. Gravestones could be seen lying over sink holes in the streets and around farmyards. Sixty years after the demolition of the church only thirteen headstones remained standing. One writer has estimated that nearly fifty gravestones were stolen, but this number appears excessive. Phillimore says that in 1869 there were twelve stones still standing, ten in good condition and two damaged. They all seem to have been of slate. The story is told that a horse was killed when it fell and was impaled on the sharp point of a broken slate headstone. A writer at the turn of the century says that he was told by an elderly inhabitant of Ruddington about a stone at Flawford which had either one or two farthings fixed on to the horizontal surface of its upper edge. Between 1840 and 1909 three more stones disappeared and the Rev. Frank Boykett, Vicar of Ruddington, warned his parishioners against further meddling with the headstones of Flawford and threatened offenders with prosecution. When the site was surveyed in 1956 the position of the six remaining stones was accurately recorded. One of these was broken and lying on the ground. Fortunately a description of the graveyard written in 19091 gave the positions of the stones and the distances between them so that it is possible to fix the positions of three stones which had disappeared between 1909 and 1956. 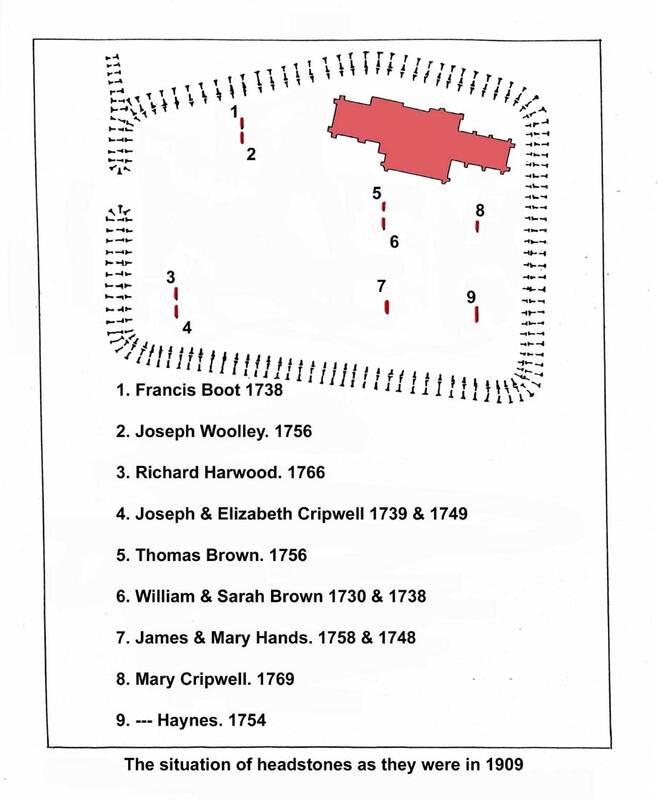 Nine named graves can therefore be located. Since 1956 no more stones have been removed but only four remain standing, one of these being very badly damaged and a second partly damaged. 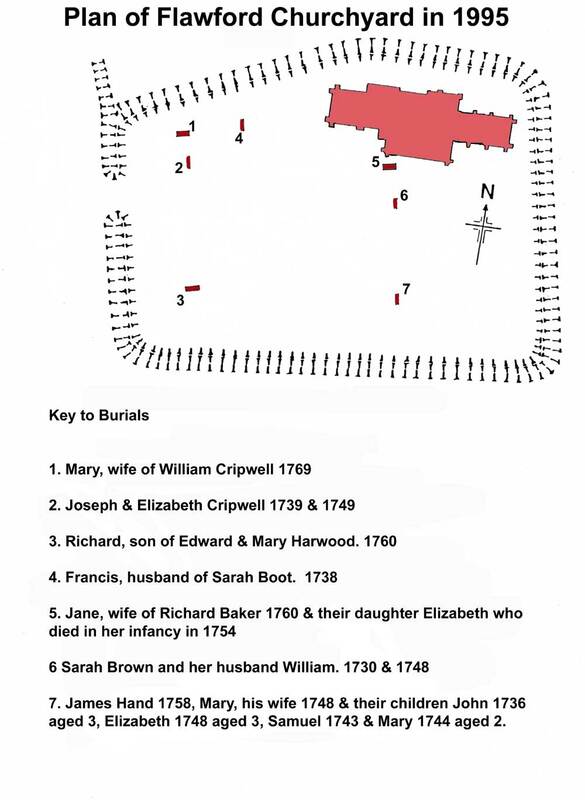 The first plan shows a plan of the churchyard as it was in 1909 with the position of nine graves and a key to their identity, whilst the second plan shows them as they were in 1995, one extra stone having been brought up from the village. An unusual feature of the remaining stones is that they all face west rather than east. The reason for this is not known; it may be that since the entrance to the graveyard is from the western side one would approach the stones from behind if they were facing the normal way. It is not known whether the stones stand at the head or the foot of the grave. The dates of the nine known stones fall between 1730 and 1769, a period of only 39 years. It may be that these stones were unmolested because they marked the graves of persons still remembered at the time of the demolition. Stones earlier than 1730 are comparatively rare in most graveyards and few early burials would have been marked by stones. Burials recorded in the first 120 years of the Ruddington Register must have taken place at Flawford and all the known stones fall within this period.